The specs for USB 3.0. It will features speeds upto 5 Gb/s, rivaling current Fibre Channel (FC) devices typically used to connect servers to SAN storage. It will introduce a new cable but keep the current connector. "The USB 3.0 Promoter Group anticipates that SuperSpeed USB discrete controllers will hit the market in the second half 2009, with the first consumer products appearing in 2010." Just logging this here, because I was crazy about it when appeared in Discovery Channel: Kitchen Chemistry. It's actually a self-taught chef with 2 Michelin stars :respect: who was simply curious about Chemistry, Physics and had the right group of friends to help combine the two. Genius! There is also a real "Moleculair Cooking" out there, where chemical characteristics are used to create amazing effects with food. My dad mentioned a Dutch book: "Cook & Kitchen"
Roughly every 8 minutes, the Sun and Earth form a magnetic highway. When they do, particles flow from the Sun to Earth. The highway is known as a "Flux Transfer Event" (FTE) and is as wide as Earth itself. There are still many unanswered questions, such as "There are many unanswered questions: Why do the portals form every 8 minutes? How do magnetic fields inside the cylinder twist and coil?" Financial crisis or not, I had been meaning to go to Iceland for a vacation sometime but seeing Impressions Of Iceland means I just Really REALLY want to go. Maybe the crisis made it slightly less expensive or perhaps more, I'm not sure. Either way, I'd really like to go there. After being separated from my grandfather for one month, my grandmother rejoined him today at her funeral in "Oud Kralingen", Rotterdam. They were married for 67 years on September 11th and have spend almost 80 years together in live. Now they'll be together forever. Rest in peace. If the number of people searching for information on Flu, allergies or sun-burns is indicative for the spread of a certain illness, you should have a look at Google Flu Trends. It is interesting to see who CDC data 2 weeks later closely matches what Google's search index shows. There seems to be a little hype going with some natural phenomenon (insert Muppet's tune here). 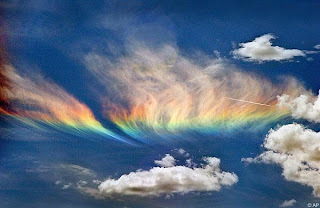 Photos of a rainbow "painted" over high altitude feather-like clouds (called "Cirrus clouds"). Gorgeous, that's for sure. You may still use IE "because it's so familiar" or "because it just works" or "because why should I change?". Well, one reason is Firefox adheres better to web standards and shows you when you've made bad (X)HTML code. But that's only relevant if you develop or design websites. Firefox also has tabs for browsing, but Opera and IE7+ have that too. IE has ActiveX plugins, but they're a big security risk due to the nature of Windows and IE. Firefox has extensions... and that's where the difference comes in!!! I have a few extensions (now called add-ons) that I can't live without. But Knowliz has a list of 50 Firefox Add-ons you should DEFINITELY use. It's a bit much, I agree and it'll slow Firefox down and increase it's RAM consumption, so beware what you add. That being said, there are some genius add-ons in his list that even I didn't know about yet... Coool! Flickr has 90 million geotagged photos. What if you combine the images that have nearby tags and see if you can get the shape of a continent close to what it's like in reality? Or a neighborhood or town or so? That what Flickr's project The Shape of Alpha has done. :) And it creates surprisingly accurate shapes of a town or city. Of course, you need dense geotagging of photos but 90,000,000 is a lot! Not everyone has Photoshop, not everyone needs and most people really don't want to pay for it. GIMP is a great alternative but may also be too much or too complicated. Then you definitely should check out 10 Awesome Online Photo Editors. Freedom of Religion does not mean "no god"
Turns out Google's platform is very reliable. So much so, they are setting a 99.9% uptime SLA for Google Apps. That is GMail, Google Calendar, Google Docs, Google Sites, and Google Talk. Of course, that does not include you and me, because we run the free services, but the Premier Edition customers get 99.9% uptime guarantee.